A company whose site was devastated by a series of explosions and a fire has been fined £250,000. 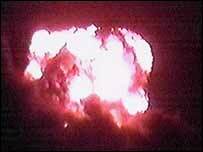 The blasts at Cleansing Service Group's (CSG) toxic waste plant in Sandhurst, Gloucestershire, in October 2000 sent a cloud of poisonous gas into the air. Villagers claimed afterwards their health was damaged. On Friday, at Gloucester Crown Court, the Southampton-based company was fined £250,000 and ordered to pay £400,000 costs after admitting health and safety breaches. Residents living nearby have campaigned for an investigation into the incident and are still in favour of a full public inquiry. 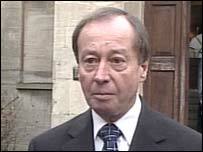 Passing sentence, Judge Jamie Tabor QC, said: "It is not my job to break the company, but the sentence has to reflect the public's grave concern and disquiet." The company was registered to deal with waste oil and oily waste only, but its operation went far beyond this and dealt with a wide range of toxic chemicals that were both dangerous and illegal. The court heard these included arsenic, phosgene and uranium. Many of these were stored next to one another in leaking drums and defective containers, next to a river on a flood plain. After the case, Ken Pee, managing director, of CSG, said: "I sincerely regret the incident and I do apologise sincerely to all the residents for the consequences on their lives of that horrendous fire and explosion." Sandhurst Against CSG campaigner David Eggleton told BBC News Online he was delighted at the fine. "They got a bloody nose which is exactly what they deserve," he said. "But who will pay the higher price? We've got to live with this for the next 20 years until they find out the full results of the error." Earlier this year CSG announced it had sold the site to Ronsons Reclamation, but the new owner is having difficulties getting planning permission to develop it. After Friday's hearing CSG issued a statement expressing "deep regret". "The company has instigated changes and improvements to its management systems and operation of such activities elsewhere." The statement says local views on the future of the site were a significant factor in the decision not to seek to recommence any activities there and to sell it to Ronsons.